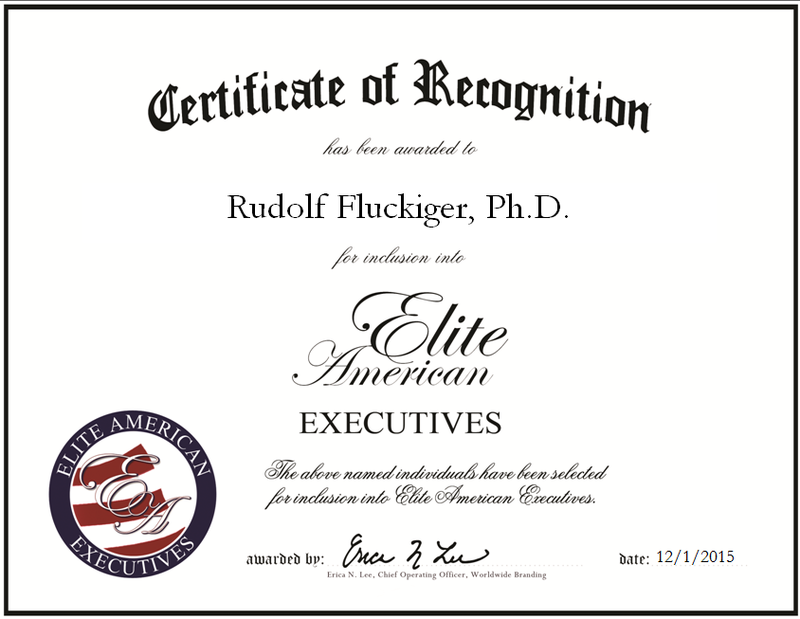 West Hartford, CT, January 21, 2016, Rudolf Fluckiger, Ph.D., President of Novacule, LLC, has been recognized by Elite American Executives for dedication, achievement and leadership in nonprofit research and development. Dr. Fluckiger is widely recognized for using his health problems as a springboard for his innovations. At just 10 years old, he suffered an aneurysm, which limited his activities and led to a lot of reading time. He received a book on science for his birthday, and the idea of eradicating chronic disease became his passion. Dr. Fluckiger went on to earn a diploma in biochemistry from the Swiss Institute of Technology and a Ph.D. from the University of Basel. He brings almost five decades of experience to Novacule, LLC, a company he founded 15 years ago. Novacule is a nonprofit research and development company that provides novel therapies for unmet medical needs. It has been largely successful, too, as Dr. Fluckiger’s work has helped with the treatment of prediabetes, as well as alleviated the pain in a volunteer suffering from chronic migraines. Dr. Fluckiger writes research plans and works on product development, along with keeping up to date with industry reading to ensure he has the most accurate information. Dr. Fluckiger attributes much of his success to his wife, along with his ability to take a negative and turn it into a positive. Over the next five years, he intends to continue to strive for the eradication of chronic illness and grow his company; he is currently in development of a new product. Dr. Fluckiger has written a number of medical publications and is in the process of having a book released through Kindle. This entry was posted in Nonprofit, Research and tagged biochemistry, chronic disease, pre-diabetes, research and development, research plans, teaching, writing. Bookmark the permalink.